Kazakhstan is a major oil producer. The country’s estimated total petroleum and other liquids production was 1.70 million barrels per day (bbl/d) in 2014. The key to its continued growth in liquids production from this level will be the development of its giant Tengiz, Karachaganak, and Kashagan fields. Development of additional export capacity will also be necessary for production growth. Although Kazakhstan became an oil producer in 1911, its production did not increase to a meaningful level until the 1960s and 1970s, when production plateaued at nearly 500,000 bbl/d, a pre-Soviet independence record production level. Since the mid-1990s and with the help of major international oil companies, Kazakhstan’s production first exceeded 1 million bbl/d in 2003. Rising natural gas production over the past decade has boosted oil recovery (as a significant volume of natural gas is reinjected into oil reservoirs) and decreased Kazakhstan’s reliance on natural gas imports. Natural gas consumption, however, has been stagnant as the infrastructure and expense required to connect Kazakhstan’s widely dispersed population to production centers in the country’s northwest has impeded development. Kazakhstan is landlocked and is far from international oil markets. The lack of access to the open ocean makes the country dependent mainly on pipelines to transport its hydrocarbons to world markets. Kazakhstan is also a transit country for natural gas pipeline exports from Turkmenistan and Uzbekistan. Kazakhstan consumed a total of 2.8 quadrillion Btu of energy in 2012, with coal accounting for the largest share of energy consumed at 63%, followed by oil and natural gas at 18% and 16%, respectively. Kazakhstan is a Caspian Sea littoral state. The legal status of the Caspian area remains unresolved, mainly driven by a lack of agreement on whether the Caspian is a sea or a lake. Until all states agree on a definition, legal status of the area will remain unresolved. According to the Oil & Gas Journal (OGJ), Kazakhstan had proved crude oil reserves of 30 billion barrels as of January 2014—the second largest endowment in Eurasia after Russia, and the twelfth largest in the world, just behind the United States.1 Kazakhstan’s current oil production is dominated by two giant onshore fields in the northwest of the country: Tengiz and Karachaganak, which produce about half of Kazakhstan’s total petroleum liquids output. The offshore Kashagan field, in Kazakhstan’s part of the Caspian Sea, will also play a major role in Kazakhstan’s liquids production in the coming years. KazMunaiGas, Kazakhstan’s national oil company, has played an increasingly important role in the country’s oil and natural gas sector. The government announced the re-introduction of oil export duties in August 2010 and increased them in January 2011. Export duties were first introduced in 2008 and then were suspended in January 2009. Export duties affect all oil exporters operating in Kazakhstan, with the exceptions of those that include a tax stabilization clause in their contracts. Kazakhstan’s two largest projects, Tengiz and Karachaganak, accounted for around half of the country’s 1.70 million bbl/d total petroleum liquids production in 2014. In the 1970s, several large discoveries were made in presalt reservoirs including Karachaganak and Tengiz. However, the development of these fields was not possible at the time because of the technical challenges of developing the deep, high-pressure reservoirs. Since international oil companies began to participate in Kazakhstan’s petroleum sector and as presalt deposits became technically and commercially viable, these fields have become the foundation of the country’s petroleum liquids production. Although it is the second-largest liquid fuels producer among Former Soviet Union republics, Kazakhstan’s future as a producer of petroleum liquids depends on the development and expansion of its three largest projects: Karachaganak, Kashagan, and Tengiz. Kazakhstan’s two largest projects, Tengiz and Karachaganak, accounted for 48% of the country’s production in the first nine months of 2014, according to data published by Energy Intelligence.5 A third large project, Kashagan, is due to start production in 2016 or 2017, with the combined output of all three projects likely to account for more than half of Kazakhstan’s total production going forward. Additionally, both Tengiz and Karachaganak consortia have discussed expansion plans that could result in increased production from these two fields within the next few years. The Tengiz partners were due to make a final investment decision by the end of 2014 on the Future Growth Project, but by early January, no decision had been announced. The Karachagank Expansion Project is at a less-advanced stage of planning. Both expansion projects will focus on increasing handling and reinjection of natural gas to increase production and ultimate recovery levels of petroleum liquids. However, continued negotiations with the government on terms and lower global crude oil prices could delay decisions on these projects. The Kashagan field, the largest known oil field outside the Middle East and the fifth largest in the world in terms of reserves, is located off the northern shore of the Caspian Sea near the city of Atyrau, Kazakhstan. Kashagan’s recoverable reserves are estimated at 7 to 13 billion barrels of crude oil.6 On September 11, 2013, production from the super-giant field commenced, eight years after the original scheduled startup date. In October 2013, just a few weeks after production began, production had to be halted because of leaks in the pipeline that transports natural gas from the field to shore. Production is not expected to resume until the second half of 2016 at the earliest. 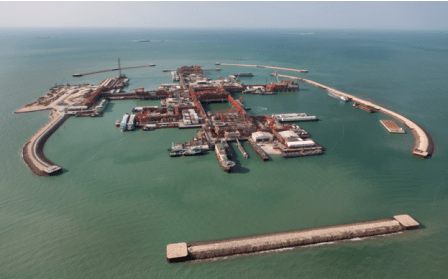 Much of the repeated delays at Kashagan were the result of the field’s adverse operating environment and complexity, resulting in significant cost overruns. The Kashagan reservoir is located more than 13,000 feet below the seabed and is under very high pressure (770 pounds per square inch). The reservoir contains high levels of hydrogen sulfide. Hydrogen sulfide is both highly toxic and highly corrosive and has been blamed for the pipeline leaks. In addition, conventional drilling and production technologies such as fixed or floating platforms cannot be used because of the shallow water and cold climate. Instead, offshore facilities are installed on artificial islands (drilling and hub islands) that house drilling and processing equipment. The processing facilities separate recovered liquid from the gas, then reinject a portion of the gas, sending the liquids and the remainder of the gas to shore for further processing. Before production can restart, these pipelines connecting the field with the onshore processing facilities will have to be replaced using higher grade materials that are more resistant to corrosion. 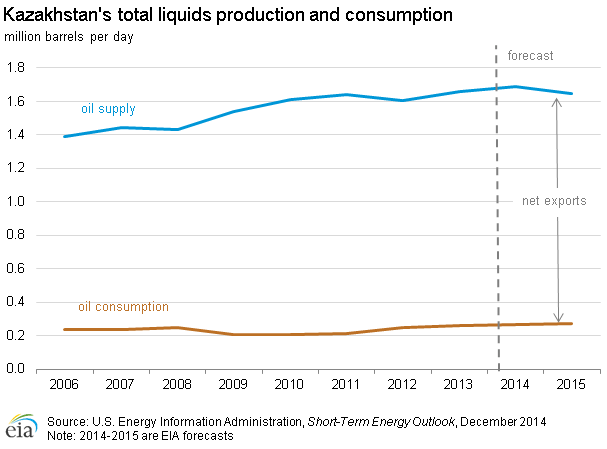 Kazakhstan is an exporter of light, sweet crude oil. In 2013, Kazakhstan exported nearly 1.4 million bbl/d of crude oil and condensate, according to the Global Trade Information Service.7 More than three-quarters of Kazakhstan’s crude exports travel around or across the Caspian Sea headed to European markets. An additional 16% of Kazakhstan’s crude exports head east via a pipeline to China. Kazakhstan’s exports will likely increase in the coming years, as production begins at Kashagan and expands at Tengiz and Karachaganak. However, the rapid growth of oil production and exports will require an expansion of export capacity. Export oil gradesKazakhstan currently has four main export oil grades: the CPC Blend, Tengiz, Karachaganak condensate, and Kumkol. With the start of production at the Kashagan field, the Kashagan grade will become part of the export mix. CPC Blend is a very light (45.3° API), sweet crude (0.56% sulfur), and it is valued for its high yield of gasoline and light distillates. Tengiz grade accounts for about 45% of the CPC blend.8 Other components include some Russian grades such as Siberian Light, as well as Kumkol and Karachaganak condensate, along with a variety of other Russian and Kazakh grades. Kumkol grade (41.2° API, 0.11% sulfur) originates from a variety of fields in central Kazakhstan. This grade is a waxy crude prized by many European refiners. It is exported both as a blend (through the Kazakhstan-China pipeline) and as a distinct grade (via the Black Sea port of Batumi in Georgia), although much of it is refined domestically, providing oil products to southern Kazakhstan. Kazakhstan’s pipeline system is operated by the state-run KazTransOil, a subsidiary of KazMunaiGas, which runs approximately 3,400 miles of pipelines. 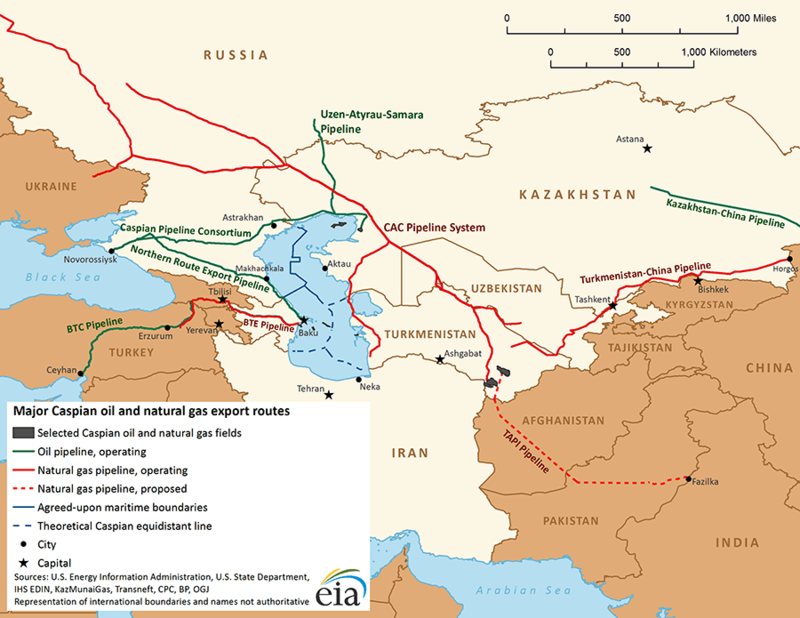 Because of Kazakhstan’s landlocked location and the continued use of Soviet-era infrastructure, much of Kazakhstan’s oil and gas export infrastructure is integrated with major Caspian oil and natural gas export routes that interlink the region. Since independence, Kazakhstan has successfully expanded and diversified its export capabilities. Major crude oil export pipelines currently include the Caspian Pipeline Consortium pipeline to the Black Sea port of Novorossiysk, the Kazakhstan-China pipeline, and the Uzen-Atyrau-Samara pipeline to Russia. 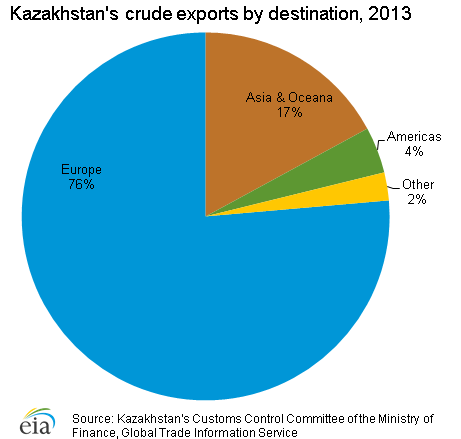 Kazakhstan also exports crude oil via the Caspian Sea and via rail. Oil is loaded onto tankers or barges at Kazakhstan’s port of Aktau or the smaller Atyrau port and then shipped across the Caspian Sea, where it is loaded onto the Baku-Tbilisi-Ceyhan pipeline or the Northern Route pipeline (Baku-Novorossiysk) for onward transport, mainly to Europe. Additionally, Kazakhstan has an extensive rail network, which it increasingly uses to transport liquid fuels both for domestic consumption and for exports. Tengizchevroil is the largest petroleum user of the rail network. It loaded approximately 70,000 bbl/d of petroleum liquids onto rail cars for transport in 2013.12 Continued expansion and diversification of Kazakhstan’s petroleum liquids transport capacity, particularly export capacity, is key to its future ability to increase production. Another potential export route for Caspian crude oil is via swaps with Iran. For years, Kazakhstan and other Central Asian countries delivered their crude to Iran’s Caspian Sea port of Neka. From there the crude was delivered to refineries in Tehran and Tabriz, with the refined products distributed and consumed in northern Iran. In exchange, Iran exported equal volumes of crude out of its Persian Gulf ports on behalf of Kazakhstan. Swap volumes have varied over the years, with little to no crude swapped over the past two or three years. Sanctions against Iran reportedly complicated swap arrangements, especially the marketing of the crude exported in the Persian Gulf, which had been done by the Iranians. Also complicating the swap arrangements was Iran’s desire to raise the fee it charged Kazakhstan for each barrel of crude swapped. Since at least late 2013, Iran and Kazakhstan have been discussing resumption of the swap arrangement and have periodically announced their intentions to resume swaps, but no swaps have occurred as of the end of 2014. Kazakhstan had crude oil distillation capacity of 345,093 bbl/d, as of January 1, 2014, according to OGJ.13 There are three oil refineries in Kazakhstan: Pavlodar, Atyrau, and Shymkent. The Pavlodar refinery is in north-central Kazakhstan and is supplied mainly by a crude oil pipeline from western Siberia, because Russian supplies are well-placed geographically to serve that refinery. The Atyrau refinery uses only domestic crude from northwest Kazakhstan, and the Shymkent refinery currently uses crude from the oil fields at Kumkol and the nearby area in central Kazakhstan. In 2013, the three refineries met approximately 70% of Kazakhstan’s gasoline and diesel demand, with most of the remaining demand met by imports from Russia. Upgrading projects were underway in 2014 at all three refineries. The upgrades will allow the three plants to produce fewer heavy products and more high-quality transportation fuels. In October 2014, the government of Kazakhstan officially backed a plan to expand the Shymkent refinery instead of building a fourth refinery in the country. With these upgrades and expansions, Kazakhstan aims to meet all domestic demand for gasoline and diesel production by 2017. Kazakhstan’s largest petroleum liquids fields also contain substantial volumes of natural gas, most of which is reinjected into oil wells to improve oil recovery rates. OGJ estimated Kazakhstan’s proven natural gas reserves at 85 trillion cubic feet (Tcf) as of January 1, 2014.14 The majority of Kazakhstan’s gas reserves are in crude or condensate-rich fields. The two largest petroleum liquids fields, Karachaganak and Tengiz, are also the two largest natural gas fields. Over the past decade, annual gross natural gas production almost tripled, from 0.6 Tcf in 2003 to 1.6 Tcf in 2012. Reinjected natural gas has accounted for most of the increase in gross production, while dry natural gas production has remained relatively stable. 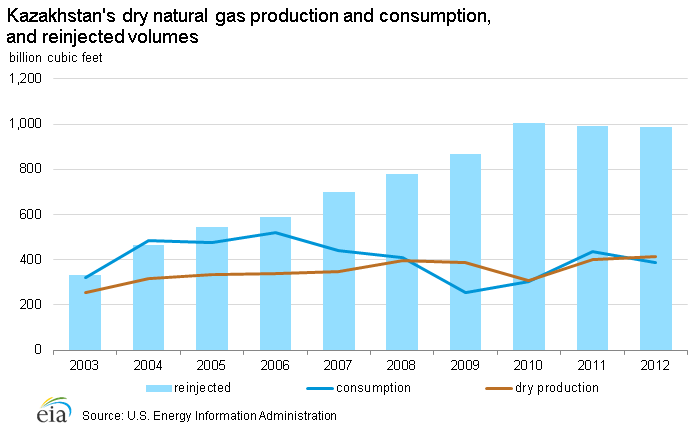 In 2012, reinjected natural gas production was more than double dry natural gas production. In 2013, the Karachaganak and Tengiz fields combined accounted for more than 90% of Kazakhstan’s raw marketed natural gas production. The Tengiz project includes a gas processing plant, which according to Chevron produced 251 billion cubic feet (Bcf) of dry marketed natural gas in 2013 that was sold to local consumers. The Karachaganak project has insufficient gas processing capacity. Most of the raw marketed production from the Karachaganak field has to be exported to Russia to be processed at a gas processing plant in Orenberg. In 2013, about 30% of this processed gas was sold in Russia, with the remainder of the dry gas returned to Kazakhstan to help meet local demand. The next phase of development at Karachaganak originally included plans for facilities to process its own gas and boost dry natural gas supplies to consumers within Kazakhstan. However, the project developers have since changed their plans, and gas produced under Karachaganak’s next expansion will largely be reinjected into the field to boost liquids recovery. 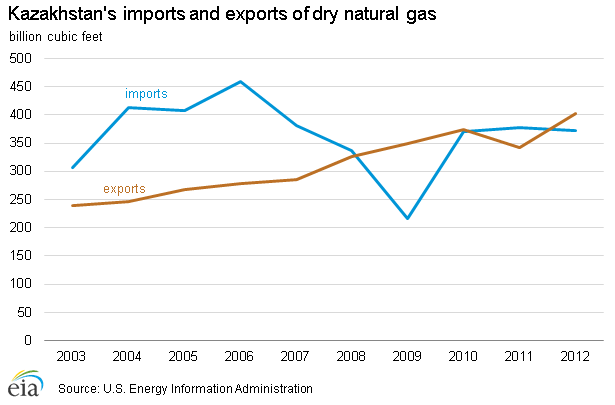 Kazakhstan has two major export pipelines for natural gas. The Central Asia Centre pipeline (CAC), which traverses the western edge of Kazakhstan on its way to Russia and points further west, and the Turkmenistan-China pipeline, which traverses the southern edge of the country on its way to China. Both pipelines are part of the regional Caspian export infrastructure and mainly carry natural gas exports from Turkmenistan, along with smaller but still significant volumes of exports from Kazakhstan and Uzbekistan. The CAC pipeline also serves local natural gas demand in western Kazakhstan, including northwestern Kazakhstan where most of the country’s production is located. A third major pipeline, the Bukhara-Tashkent-Bishkek-Almaty pipeline serves local demand in southern Kazakhstan with imported gas from Turkmenistan and Uzbekistan. Two of Kazakhstan’s three underground gas storage facilities are located along this pipeline. The domestic pipeline system in Kazakhstan is underdeveloped. Natural gas production in the country is concentrated in the northwest and is not connected to population centers in the south, north, center, and east. A government objective is to develop a domestic natural gas system that would connect the country’s producing and consuming areas. Kazakhstan is already on its way to meeting the first part of this challenge, connecting the existing gas pipeline infrastructure in the West to the existing infrastructure in the densely-populated South. The Beineu-Bozoi-Shymkent pipeline is under construction and is expected to be completed by the end of 2015 with a capacity of approximately 350 Bcf per year.15 This pipeline will allow Kazakhstan to gasify communities along the route of the pipeline that previously had no access to gas. It will also connect to the existing pipeline serving southern Kazakhstan, replacing imported natural gas in those markets. Finally, it will connect to the pipeline to China, allowing production from northwestern Kazakhstan to be exported to China. Plans for gasifying other parts of the country and connecting them to the existing infrastructure in the West and South are more uncertain. The vast distances and relatively low population density in the north, center, and east make the economics challenging for any potential gas pipeline projects to serve the region. 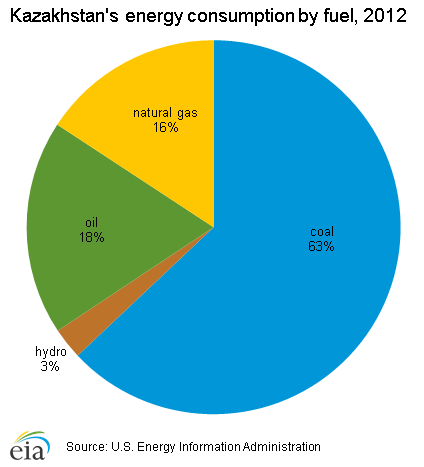 In 2012, coal accounted for 63% of Kazakhstan’s total energy consumption. Kazakhstan had 37,038 million short tons (MMst) of total recoverable coal reserves in 2011. It is in the top ten countries in the world in terms of coal reserves, coal production, and coal exports. It is also 12th in the world in terms of coal consumption. Despite being among the top coal countries, Kazakhstan is a relatively small contributor to global coal volumes. The top three countries globally account for disproportionate shares of total global coal reserves, production, consumption, and exports (between 60% and 70% combined), while Kazakhstan accounts for between 1% and 4%. About a quarter of Kazakhstan’s coal production is exported, with most of that going to Russia.16 All of Kazakhstan’s coal exports and most of its production consist of steam coal, suitable for burning in electric power plants or in other applications to generate steam and heat. Kazakhstan also produces smaller quantities of metallurgical coal that are consumed domestically. Kazakhstan is rich in a variety of minerals, with mineral and coal deposits concentrated in the north and center of the country. Coal is a major energy source for the mining and smelting industries and for the electricity sector in Kazakhstan. Most of Kazakhstan’s power generation comes from coal-fired power plants, concentrated in the north of the country near the coal-producing regions. Kazakhstan’s total installed generating capacity was approximately 17.8 gigawatts (GW) at the end of 2012, 87% of which was fossil fuel-fired, 13% was hydropower, and less than 1% was other renewables. Kazakhstan’s total net generation in 2012 was approximately 86.1 billion kilowatthours (kWh) of electricity. Kazakhstan’s only nuclear power plant, a BN-350 nuclear reactor at Mangyshlak, was decommissioned in 2001. Kazakhstan has some of the largest uranium deposits in the world and is the world’s largest uranium producer.17 Although plans have long existed to build additional nuclear power plants, there has been little progress on constructing these units. Kazakhstan’s national grid is operated by the Kazakhstan’s Electricity Grid Operating Company, a state-owned company. It is responsible for electric transmission and network management. There are 15 regional electricity distribution companies, a number of which are privately owned. The electricity transmission and distribution sectors are considered to be natural monopolies and are regulated by the government, however, wholesale generation of power is considered to be a competitive market with most generation assets owned by private enterprises. Data presented in the text are the most recent available as of January 14, 2015. 1Oil & Gas Journal, “Worldwide look at reserves and production,” (January 1, 2014). 2Tengrinews, “Nazarbayev rearranges Kazakh government,” (August 6, 2014). 3KazMunaiGas Exploration Production, Annual Report 2013, About the Company, Ownership Structure, accessed December 17, 2014. 4U.S. Department of State, 2014 Investment Climate Statement – Kazakhstan, accessed December 18, 2014 and Office of the U.S. Trade Representative, 2014 National Trade Estimate Report on Foreign Trade Barriers, Kazakhstan, accessed December 18, 2014. 5Energy Intelligence, Nefte Compass, “Kazakh Crude Oil and Gas Condensate Production, September 2014” (October 23, 2014) p. 9. 6Eni, Innovation & Technology: Kashagan, accessed December 15, 2014. 7Global Trade Information Services, Customs data from destination countries, accessed December 10, 2014 (subscription). 8Chevron Crude Oil Marketing, CPC Blend and Tengiz, accessed December 9, 2014. 9Chevron Crude Oil Marketing, CPC Blend and Tengiz, accessed December 9, 2014. 10Chevron, Kazakhstan Fact Sheet, accessed December 9, 2014. 11Lukoil, Fact Book – 2013, International projects – Kazakhstan, p. 38. 12Chevron, Kazakhstan Fact Sheet, accessed December 9, 2014. 13Oil & Gas Journal, “Worldwide Refining,” (December 2, 2013). 14Oil & Gas Journal, “Worldwide look at reserves and production,” (January 1, 2014). 15KazTransGaz, MG “Beyneu – Shymkent” building, accessed December 10, 2014. 16Tengrinews, “Kazakhstan wants to export coal to Ukraine, China and Europe,” (June 2, 2014). 17World Nuclear Association, World Uranium Mining Production, accessed December 15, 2014.